Heartland Theatre Company has announced auditions for THE END OF THE TOUR, a play by Chicago playwright Joel Drake Johnson, to be directed by Sandi Zelinski. The photo at right shows the cover of the play, published by Broadway Play Publishing, Inc. To purchase a copy of the play, click here. In THE END OF THE TOUR, Joel Drake Johnson offers a darkly funny play about the deeply flawed, deeply disconnected members of the Pierce family in Dixon, Illinois. While Mae hangs onto the memory of having once sung for Dixon’s favorite son, Ronald Reagan, her daughter wonders if she can bear one more minute with her mother and her estranged son struggles with even the briefest reunion. Who owes what to whom? Who belongs to whom? What does it mean to be related to people and a place you really don’t like very much? THE END OF THE TOUR was nominated for a 2003 Jeff Award for best new play after its Victory Gardens premiere. Albert William, in "The Reader," said this about THE END OF THE TOUR: "Joel Drake Johnson’s new play is a sensitively written portrait of a fragmented family…. Johnson balances gallows humor with acute insight and compassion. He creates characters so real you wonder what will happen to them after the final blackout — and hope that the healing effects of time will allow parent and children to reconcile and thus reclaim life’s most fundamental and precious relationship." Roles to be filled include Mae, 68-70; Jan, her daughter, 48-50; Mae’s son and Jan’s brother Andrew, 37-40; Jan’s husband, Chuck, 50; David, Andrew’s boyfriend, 35-38; Tommy, a friend of Chuck’s, 48-50; Brenda, a voice over the PA, and Norma, an elderly patient. The ages given for all these characters are only approximate. Audition dates are set for Monday, February 21 and Tuesday, February 22, from 7 to 9:30 pm at Heartland Theatre. If you choose to audition, you will be asked to read from the script with other actors. You should plan to be present for the entire audition session on the night you select. 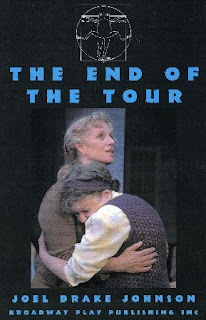 THE END OF THE TOUR will be performed April 14-17, 21-23, 28-30 and May 1, 2011. For more information about the auditions or THE END OF THE TOUR, you may call 309-452-8709 and leave a message for Mike Dobbins, Heartland Theatre Company Managing Artistic Director, or write to him at boxoffice@heartlandtheatre.org. The audition notice appears here on Heartland’s website, with directions to the theater here. Eager to see this one at Heartland. Loved Proof! You know Joel Drake Johnson, don't you, Kathleen? Used to read his theatre reviews!! Hi Julie. Enjoy your blog. What do I need to do to get listed as a local author? PS: I knew J.D. Johnson when he was a scene designer , TD in Chicago. His first play was produced at Victory Gardens about the time my "Martin Luther: Apostle of Defiance" was produced there.